As book bloggers we are use to working with words - after all the "product" we are talking about is filled with words. However, we must think about what is eye-catching. Much like the cover of a book can attract a reader, images you use in your posts can attract readers. We already know that we should include the book cover in our posts. With image sites like Pinterest and Instagram becoming increasingly popular, you will want images that really "pop" or are attractive. Sometimes a bookcover alone will be spectacular enough to catch the eye, but you may need to get creative. Now if you have only the electronic cover it may be more difficult. I know some bloggers make banners and other images that include the cover. However, you do not own the image of the cover and you could be violating copyright. Now if the book is available in hard copy, then you have more options. (Even if you don't own the book, you may be able to find it in your library or at the local bookstore). I know it is strange to think about, but doing a "photo shoot" with books can be a fun way to promote your posts. 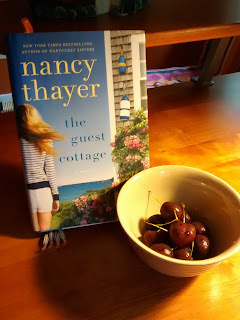 I took the picture above when I was reading The Guest Cottage by Nancy Thayer. While reading the book I kept thinking "life is like a bowl of cherries". So I thought it made a good photo op. You can use more than book covers in your posts. Perhaps a book is set in a place you have visited and you have pictures from your trip. Shadow of Night by Deborah Harkness takes place partially in Prague and a few years ago I went there. Though my pictures were not from the 1590s I did have pictures of some of the places mentioned in the book. You won't necessarily have to travel far and wide for images. Was a field of flowers the site of a favorite scene or was the book about a country girl visiting a big city for the first time? These are images you may be able to find near you. Taking pictures isn't really my forte. I often think "that" would make a great photo, after the fact. Or maybe I have the "perfect" picture, except it is a little blurry. Thankfully there are a number of great photographers that make their work available for free under a creative commons license. There are a number of sites that offer royalty-free stock images, but as a blogger you may not have the budget for purchasing such photos. I know I don't and am always on the lookout for FREE photos. One place I find creative commons and public domain images is Wikimedia Commons. It can be a bit of a hit or miss in finding the right image and you may have to wade through some less than spectacular quality. What I like best about the site is that it provides all the info you need to accurately attribute images. A similar site where I have found most of my images is PhotoPin. The quality of the images is wonderful and I have always found an appropriate image. Again it gives the appropriate attribution for each image and it allows you to choose what size you want to download. A drawback though is that is difficult to attribute a image used on social media. 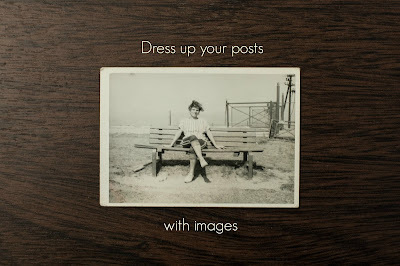 Posts on Facebook and even Twitter get more engagement when accompanied by a photo. That is why I was happy to discover Hubspot is offering more then 500 free stock images that require NO attribution. Another author mentioned LibreStock and I have taken a look around. It is basically a search engines for images. It links out to free stock images on other sites. I took a look at the site and it has a wonderful photos. I also like that many of the images do not require any attribution. Whenever using images that are not your own you are responsible for ensuring the legal use of that image. You are required to perform due diligence in making sure that the site you got the image from has the legal right to offer the image for use. There have been cases were someone uploaded an image to a site as either public domain or under a creative commons license when in fact that person did not have any rights to the image. Anyone who used the images, though they thought they were using it legally, were found at fault for violating copyright. I agree with you, want to add some, use only proven storage with royalty free content like this http://www.cannypic.com/ it's the main tip to make your article better and don't have any troubles.